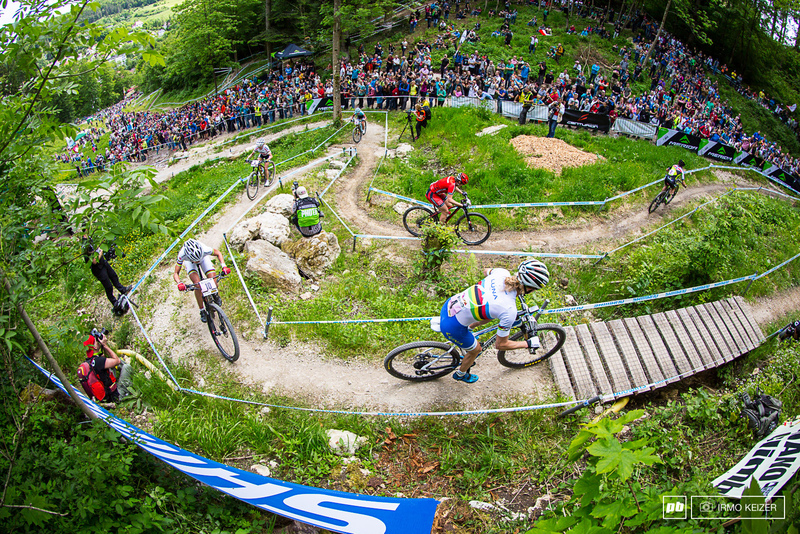 After 11 days in Europe it was time to line up again for round two of the World Cup series. Luna had spent an ideal week south of Albstadt on the Danau (Danube river) watching canoe and Kayaker’s paddle past, riding along the lush river valley under castles perched on cliffs and enjoying delicious fresh baked bread daily. Perks of Europe! 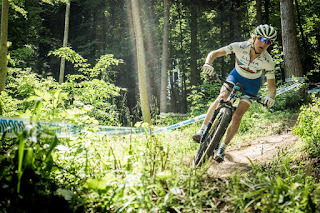 With more time away from travel and jet lag I was feeling mentally and physically much more amped to race. There’s nothing like having 2+ minutes put into me in a race to light my fire! The start box reserved for the top 8 women, has the sound and intensity of a bee swarm. 8 women doing their final warm up, knobby tires on trainers, managers and media swarming back and forth, everyone focused on their role. With 5 minutes to go we roll to the line and our preselected start positions. I was feeling ready to go and determined to see the front end of this race. The gun went off, the bees were released and we swarmed the first corner. Lining up on the outside to carry speed around the first left hander back fired, I got pushed out to the fence and lost positions, as we entered the corner a second time, having completed the start loop, for some reason I thought this time I would get through that corner using the same line, but again: fence, the price of not adapting. The first climb is only wide enough for one rider and so steep that down the line it feels like the pack has come to a halt. Inevitably someone dabs and then you are all running. Actually this would have been ideal, but we were walking. 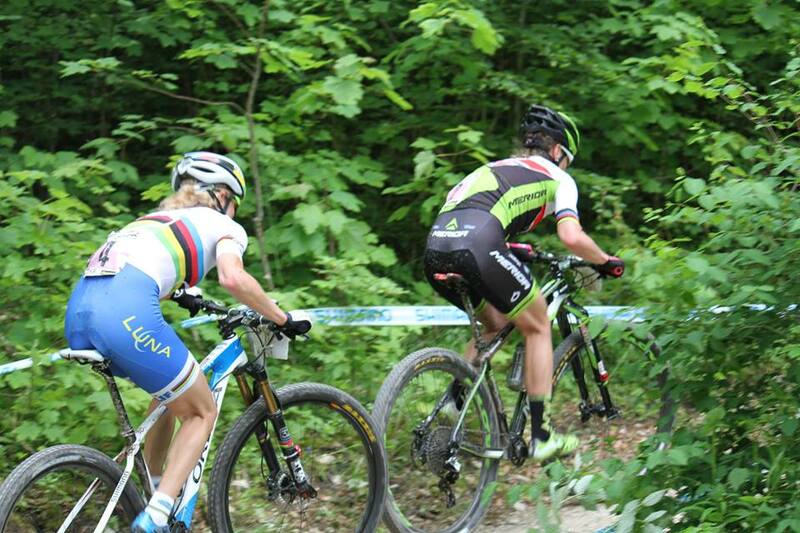 By the time I summited that first climb, Jolanda, the race leader was already entering the next climb. 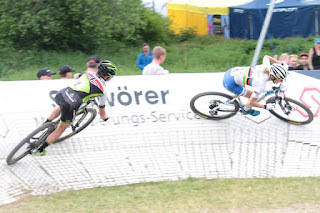 Although I committed to my plan of racing to lead lap 1 and worked my way through traffic making some passes on the descents and climbs I felt pretty proud of, and catching positions 2-10, I still lost a demoralizing 50 seconds in lap one. 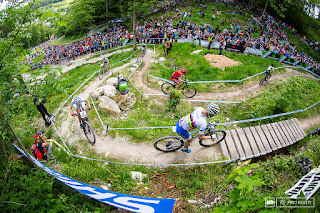 Always great crowds in Albstadt. Especially with a sunny day. Luckily wins aren't the only goal and performance of value in racing. With Gunn-Rita in the chase group I knew I had a rider I could work with to have my best performance on the day. 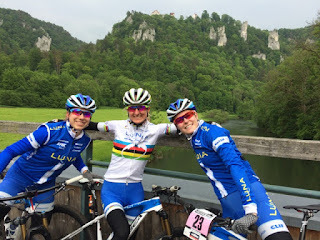 Together we pulled away from the other chasers, accompanied by a time by a very talented u23 swiss rider Linda Indergrand. Aside from lap 1, Gunn Rita and I together clocked most of the fastest laps. Between the two of us we have 40 World Cup wins and 6+? World Championships (the lion share belong to her). We race to win, we race to give our best ride and we worked together equally and let our legs and gumption have the final say. It made the 7 relentless laps satisfying. In the end we were so evenly matched it came down to a pass in the final 100-200m. Gunn Rita made the winning move and I came home for 3rd, satisfied with a big improvement from 1 week earlier and disappointed to not have another World cup or relentless challenge the following week to attend. So I'm headed back home, but rather than wanting to recharge I am energized by racing and want more of it! Next stop: BC races, Colorado Springs US Cup finals and finally Lenzerheide World Cup first weekend of July. Congratulation for achievements. You paid for your hard work. Go ahead. God bless you!